Social travel website Gogobot started with plain recommendations from your friends for destinations of your next travel. They ventured into hotels last year, where Gogobot has enabled travelers to find great hotels based on what’s popular in their networks. Then it enhanced the search capability by launching realtime pricing tools through a partnership with DealAngel, a hotel comparison startup. This allowed users to cut through the noise and find some transparency in hotel pricing while researching a trip. With its DealAngel integration, users can view a color-coded calendar through which they can find the cheapest dates based on average hotel prices and avoid dates when trade shows or other events drive up pricing, for example. On top of that, the realtime pricing and availability data enables Gogobot users to plug in dates to see actual prices of hotels on the dates they’re traveling and book with a single click, without being subject to those annoying pop-up windows endemic to other review sites. Next up was booking great restaurants via OpenTable integration, allowing diners not only to tap into their social networks to discover restaurants they might enjoy, but actually lock in reservations with a single click via an OpenTable button on each location page. This followed by integration with Google Street View, which enabled users to access a 360-degree view of the location. While Street View has become a staple when we’re looking for directions or maps, Gogobot is one of the only travel sites to offer deep integration with Google’s tech. Obviously, this is a key extension to the current Gogobot search experience, as traditionally users have been limited to static, 2-D photos when perusing destinations and cool restaurants. Today Gogobot announced a team-up with Travel + Leisure to bring its 2.5 million registered users a streaming feed of the publication’s best photos, reviews and destinations. Gogobot has already built out a social foundation, allowing people to write their own reviews of their favorite destinations — using their real identities to add a layer of trust. By teaming up with Travel + Leisure, Gogobot is building out the other half — content and recommendations from experts and trusted names in the travel space. One of Gogobot’s most popular mobile features has been its digital postcards, which provide a visual look into top travel destinations by way of its repository of user-generated images, through a partnership with Flipboard. Now, Gogobot will be doing the same with Travel + Leisure content, posting a stream of digital, thematic guides culled from T+L’s content. 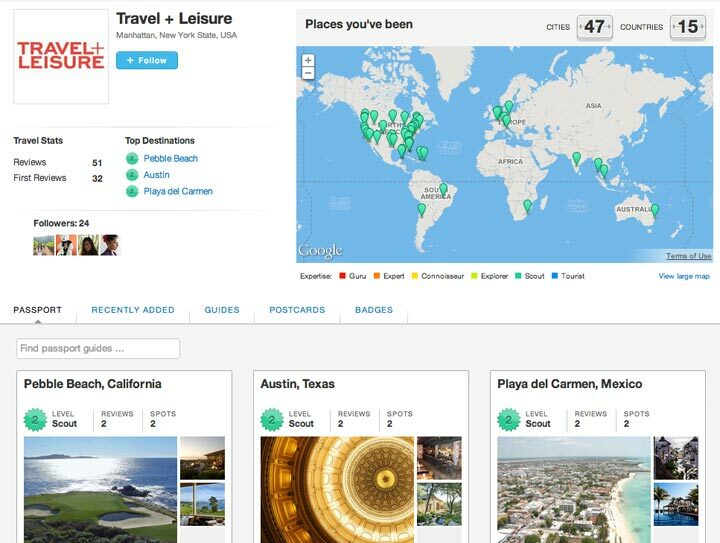 Travel + Leisure will also be posting their picks for the best and hotels and destinations into Gogobot via mobile and will allow users to follow them to keep track of their picks or check out those thematic guides. On top of that, their reviews of hotels and resorts will begin appearing on Gogobot’s topic pages alongside user reviews. Again, this allows Gogobot to complement the crowdsourced travel knowledge and content from its 2.5 million users with a trusted editorial perspective.